Alt-J blew the proverbial roof off of the Santa Barbara Bowl last week when they played to a sold out crowd under the stars. The band set the tone for the night the moment they took the stage. The fellows, who hail from Leeds, England, opened with “Hunger of the Pines,” a haunting, slightly ominous tune off their latest record This is All Yours. The band was silhouetted in blue lights that throbbed hypnotically to the pulsing beat. White smoke swirled around stage, courtesy of a fog machine, adding a forbidden-forest effect. Their entire set proved to be as evocative as the lead off number. Next, Alt-J dove into tracks from their debut album An Awesome Wave playing “Fitzpleasure” followed by “Something Good.” Thanks to their unique stage placement of setting drummer Thom Green alongside the rest of the band in a row—singer guitarist Joe Newman, keyboardist Gus Unger-Hamilton, and bassist Cameron Knight–the audience could clearly see him create his innovative rhythmic structures and fluctuating tempos. And although the words sung by Newman are mostly unintelligible, his unusual phrasing and shifting vocal timbre creates an appealing aural thread throughout the numbers. It’s a method Scottish singer Elizabeth Fraser from Cocteau Twins used to great effect; the vocals are more an instrument than a way of conveying clear lyrical content. Throughout the evening keyboardist Unger-Hamilton occasionally spoke to the crowd, thanking them for coming or introducing the next song, but mostly chatting was kept to a minimum. 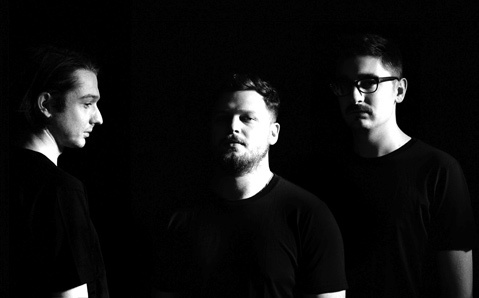 But engaging in storytelling was unnecessary as Alt-J’s music wove an epic tale of its own. It was a visual and audio performance for the ages.